Browse our current specials, deals and competitions. We’re excited to announce the opening of our third restaurant in Sydney’s iconic Circular Quay. Find out more about Four Frogs Creperie Circular Quay here. Love the cinema? So do we. That’s why we’ve partnered with the Ritz Cinema Randwick to offer you an exclusive dinner deal at Four Frogs Creperie Randwick. This deal is perfect if you’d like a night out at the cinema including dinner, either before or after your movie. And because we’re located directly opposite the cinema, your couldn’t be easier to arrange a movie night out with friends. Four Frogs Creperie Randwick is located on 30 St Pauls St Randwick. Find out more about our Randwick restaurant or phone 9398 3818 for bookings. If you’re looking for a child friendly restaurant to take your tots to, look no further than our Mosman and Randwick creperies. We are pram-friendly and have a dedicated kids menu – which your little froggies can also colour in! 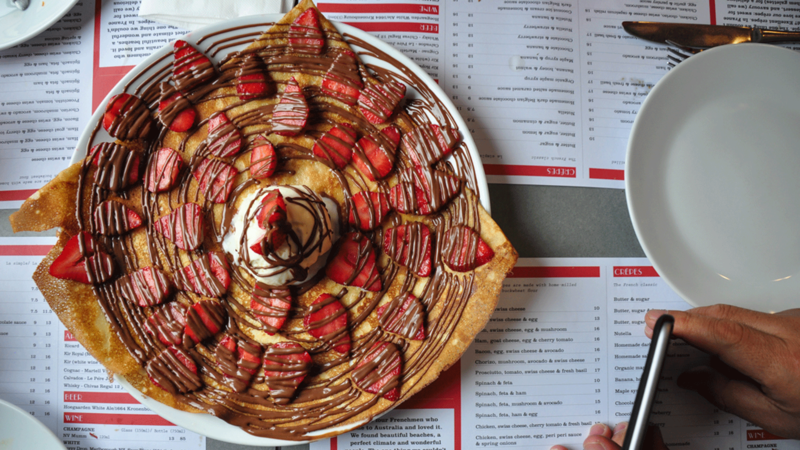 Our sweet crepes for kids start from $5 while galettes (savoury crepes) start from $7.50. Of course, we’re happy to make up a special crepe with your ingredients of choice if your child has a particular favourite. If you or your children have a sensitivity to gluten, we’ll be happy to cook them a sweet crepe with our savoury base, which is made from buckwheat which we mill in the store. We also have a range of drinks and milkshakes for your little ones to enjoy with their crepes. View our full menu here, or find out more about Four Frogs Creperie Mosman and Four Frogs Creperie Randwick. Join our mailing list and we’ll send you a birthday treat.